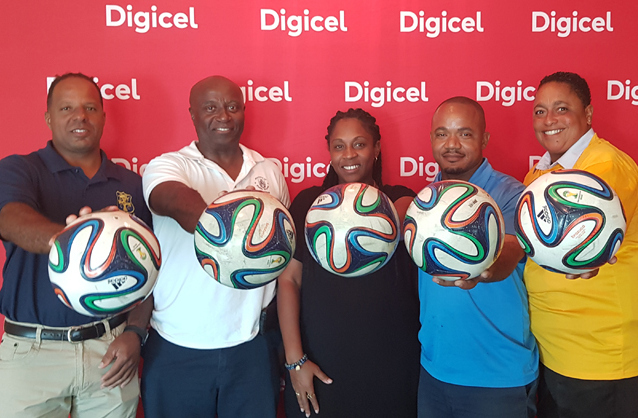 Digicel donated four packs of equipment to local football clubs including Wolves, Boulevard Blazers, St David’s and the Devonshire Cougars. The packs included Adidas footballs, bibs, T-shirts, cones, whistles and water bottles. The donation was made to clubs as the telecoms company recognized the need for equipment at clubs which often might lack such equipment or not have the funds to purchase new items. Commenting on the donation Donn Foggo, Digicel marketing manager said, “Digicel is no stranger to investing in youth sports and young athletes. For years we have lent support where we could throughout Bermuda. Namely to events and athletes such as the U-12 Super Summer Cricket Series, Tyler Smith, Erica Hawley and Olympian Ceci Wollmann. “Not to forget our bigger sponsorships which include Eastern County Cricket. With the new football season underway we’re aware many clubs lack kit and equipment when it comes to training and we trust the players, at all levels, will benefit from this small donation. “This is the first step in what will be a bigger involvement in youth football and we’ll have some exciting news very soon,” he added. Since 2016, Digicel has donated over $300,000 in various sporting, cultural, charity and musical events as well as supporting youth sports and athletes through sponsorships, donation of services and supply of kit.